Replies: 51 (Who? ), Viewed: 80736 times. #1 16th Mar 2006 at 3:26 PM Last edited by Numenor : 17th Mar 2006 at 8:51 AM. 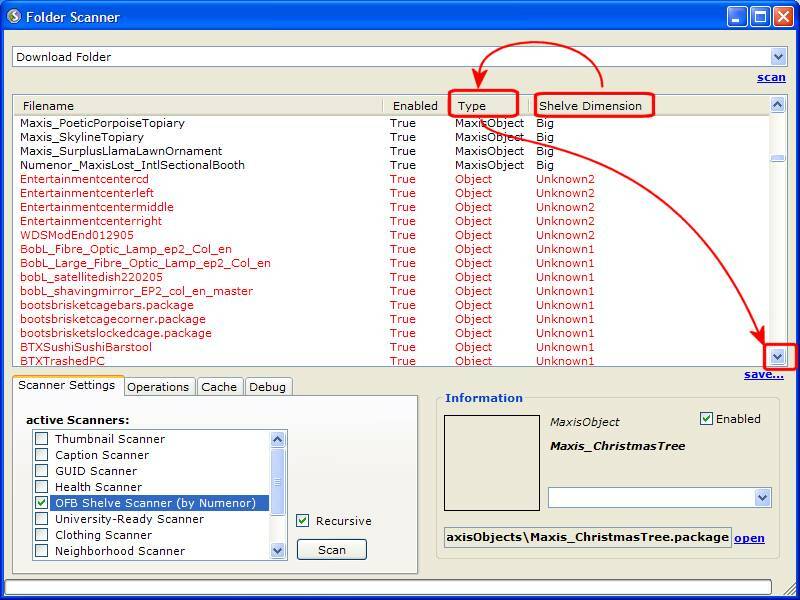 If you have Open for Business, you may have noticed that custom objects can't be placed on Maxis' business shelves; this is because the custom objects don't contain any information about their physical size, and this information is needed for the game to properly place the objects on the shelves. All the custom objects in the Downloads folder, therefore, must be "fixed", in order to provide the missing information. (Read the technical explanation on post #2). Start SimPE and select the menu Tools -> Scan Folders; the Scanner window will open up (the Scanner has a lot of functions: we will use it *only* to batch-fix the shelf placement). In the topmost drop-down list, the "Download Folder" should be already selected by default (if not, select it by clicking on the arrow located on the right of the drop-down menu). 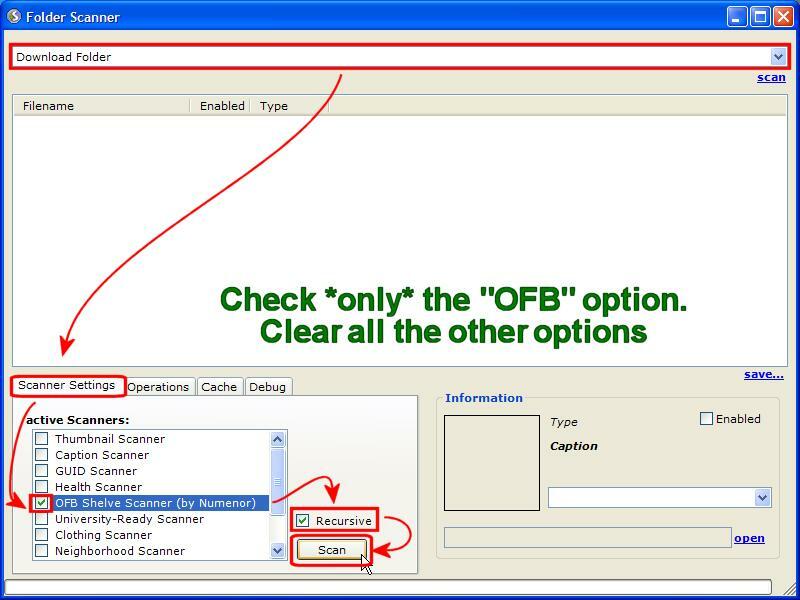 Select the "Scanner Settings" tab and deselect all the options, except "OFB Shelve Scanner" (be warned that there are more options in the list then the ones visible: scroll down in order to see them, and deselect them, too). Select the "Recursive" option and lastly click on the "Scan" button. Wait for the scanner to complete its task (if you have a huge Downloads folder, it may take a while!). When finished, sort the list by clicking on the "Shelve Dimension" column title, and then on the "Type" title. Then, scroll down until, in the "type" column, you'll see the first Object files. IMPORTANT: ignore any other file type different than "Object", including - unless you know exactly what you are doing - the "Maxis Objects"; scroll down until you see the "Object" files. Now, you have to select all the "Object" files that have an "Unknown..." tag; again, ignore all the files (even if reported in red) that are not "Object". You can select an entire block of files by selecting the first line of the block, and then shift-clicking on the last line of the block. When the block of files is selected, click on the "Operations" tab (in the bottom-left); here, you can set the size for all the selected objects: Big, Medium or Small (read hints about choosing the most suitable size on post #2). The chosen Size will be applied to *all* the selected objects! When done, click on "Set Shelve Dimension", and you have finished. #2 16th Mar 2006 at 3:27 PM Last edited by Numenor : 16th Mar 2006 at 7:47 PM. WHICH "SIZE" TO CHOOSE? BIG, MEDIUM OR SMALL? WHAT HAPPENS IF YOU CHOOSE A "WRONG" SIZE? 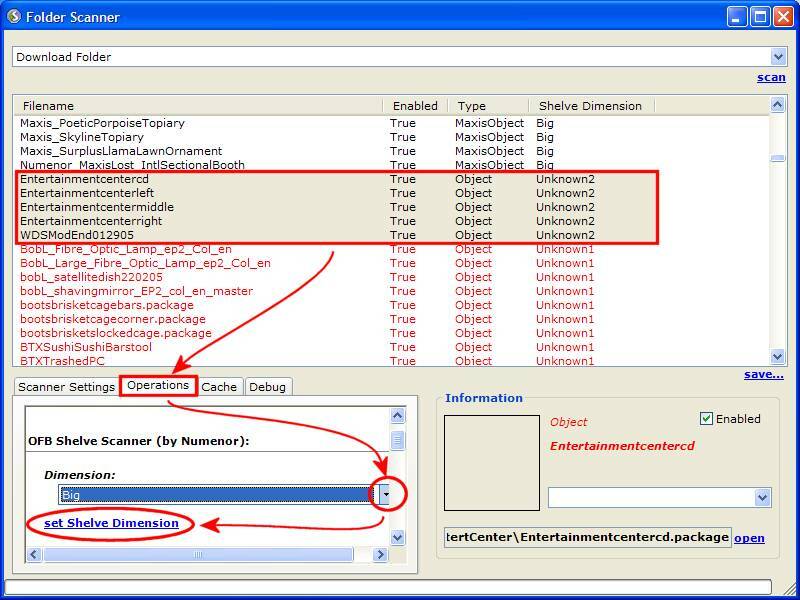 Obviously, you *have* the possibility to set the size of the objects one by one, choosing the most suitable size for that particular object (you can understand what each object is, by reading its filename on the first column, or by selecting it and clicking "Open" in the bottom-right corner). But if you have many downloaded objects to fix, it would take too long. Therefore, you'll probably find more convenient to provide the same setting for all the objects, taking the "risk" that som objects will get a "wrong" setting, compared to their real size. The consequences are not harmful, anyway: basically, some objects may show an inproper placing on the business shelves. All objects set to "BIG": if you choose to assign a "big" size to all objects, the smaller custom objects will be treated by the game as large ones, and therefore you'll be able to place only one item of that type per shelf; the shelves will look a little "empty", but that's all you risk. This is the "safest" choice, because in no cases the objects will intersect, overlap od collide with the other objects. All objects set to "SMALL": in this case, you'll be able to place up to six objects on a single shelf; but if the objects are big, they will overlap each other: not a beautiful sight In any case, you can always choose not to put six objects of that type on the shelf...! (Note: when placing an object on the shelf, you can press the "M" key in order to select the location of the object, among the six available). All objects set to "MEDIUM": this is an adviceble setting, because it allows to place up to two objects on the same shelf; some larger objects may overlap, and some smaller objects may look "lonely" on the shelf, but this is an overall good choice, in my personal opinion. BATCH-FIXING ALL THE CUSTOM OBJECTS IN THE DOWNLOADS FOLDER WILL FINALLY SOLVE THE ISSUE CONCERNING THE "RESTOCK SIGN" BEING MISPLACED? It will greatly help, yes; but from the reports I've recieved by many users, I guess that there is a bug in the game that can't be solved that easily; therefore, every now and then, you still will see your restock signs being "teleported" at one corner of your lot. AFTER HAVING FIXED MY DOWNLOADS, MAY I STOP USING NUMENOR'S HACKS? Yes You don't need it any more. If, while playing, you notice that a particular object (perhaps a recently downloaded one) can't be placed on the OFB shelves, run this tutorial again. TECHNICAL EXPLANATION OF THIS "FIX"
Maxis started to use a previously unused data field in the Object Data: the data field 0x004F [Unused - Shadow Brightness (Sims1)]. I've noticed that almost all the existing objects, before OFB, had this field set to 0x96 (very few had a value of 0x64); while in OFB the objects have a value of 0x2 (small objects), 0x1 (medium objects) and 0x00 (large objects). The Scanner, when used as explained above, writes in the data field 0x004F the value corresponding to the selected "size"
Thanks Numenor ! This is an excellent work !!! Only a question:This "update" is only necessary for "old" custom objects, isn't it ? This fix is needed for all the old objects (i.e. all the ones that were cloned before OFB was released). But still today, many creators clone objects deactivating the EPs from within the SimPE File Table (to ensure compatibility with the base game, as explained in this thread). I order to ensure compatibility with the base game *and* with OFB, the creators should manually set the proper value (0, 1 or 2) into the OBJD field 0x004F. I guess that many creators will "forget" this, especially in these first days, and therefore - every now and then - a new scan of the Downloads may be needed. #6 17th Mar 2006 at 12:14 AM Last edited by MizzesSimmer : 17th Mar 2006 at 12:23 AM. I was wondering how you did this. Since I corrupted my game the last time I "played" around with SimPe, i was a little afraid to try finding the solution myself, lol. Thanks for explaining it here, its appreciated! One question, some of my custom objects say indetermined, should I change that to a more suitable size? I would prefer medium, two per shelf as you say. ***Edit, oops nevermind. I was just skimming through, not actually reading what they were. (Recolors, lol) But thanks anyway. If SimPE says it is "Indetermined", probably those files are NOT "Objects": usually the "indetermined" things are Wallpapers, recolours, hacks and such. You can only set the dimension for files marked as Objects. Yes, I realized after actually looking at them, lol. Guess I was overly excited. I was following your tut and when i got to the part of selectingthe objects under types I have a question do i select all the objects with unknown2 and 1 i have no unknown only. I don't want to click on the wrong thing so can you please help me out. Unknown 2 and 1 can be selected altogether. System.OutOfMemoryException: Exception of type System.OutOfMemoryException was thrown. I'm sorry, I can't answer to your question. You should ask it in the SimPE Bugs Forum, over at SimPE site: Quaxi himself will answer you soon. I gotit done I believe the problem was when doing the tut I didn't take your hack out , I took it out and now it batch fixed them :-) once again thanks for this wonderful tut, much appreciated as you are! Thank you, Numenor! It worked! If you need a promotional blurb for this tutorial, you might say, "So easy, even Hairfish can do it!" This message has been deleted by kat92. Thank you Oh Moderator of Llama Gods ! thanx numenor ..... really helpful Tutorial .. So, I ran into a problem early. Your directions are perfectly clear, but my Scan Downloads just shows the dropbox at the top. I have nothing below that with the options that appear in your screenshots. Do you have any idea what the problem may be? And you can add my name also! This is the first thing I have tried, I d/l SimPE just for this and you made it sooooo simple to follow! I'm an ol' goat but you made this easy to do, you can teach an old dog (or goat) new tricks! Thank you so much, we luv you for all you do for us! I Don't Now How To Do It??? This message has been deleted by Dan1034. Dan, I sincerely think that the pictures explain quite well the steps to be done. Read carefully the text, and ask me to explain any part that seems obscure to you. thanks much for the tut .